Building a computer is just like legos, if a part seems like it will fit, it probably is the right spot for the part. I am going to be building a computer with a budget of $1200 here. The parts I am using for this build are current to April, 2011. If you are building at a later date or with a different budget, the same directions will still apply, but I suggest finding the best parts under your budget. I highly recommend asking the folks over at computerforums.org for recommendations based on your budget, they are extremely helpful with any help you may need. This budget is simply for the computer itself. If you are also are in the market for a monitor, speakers, keyboard and mouse, you will need to either change the components or your budget. The list of parts used for the build will be as follows: for the CPU(central processing unit), we will use an Intel i7. The new Sandy Bridge has proven to be very successful, so we will use the new i7-2600 model with a clock speed of 3.4GHz. This processor uses the LGA 1155 socket type. 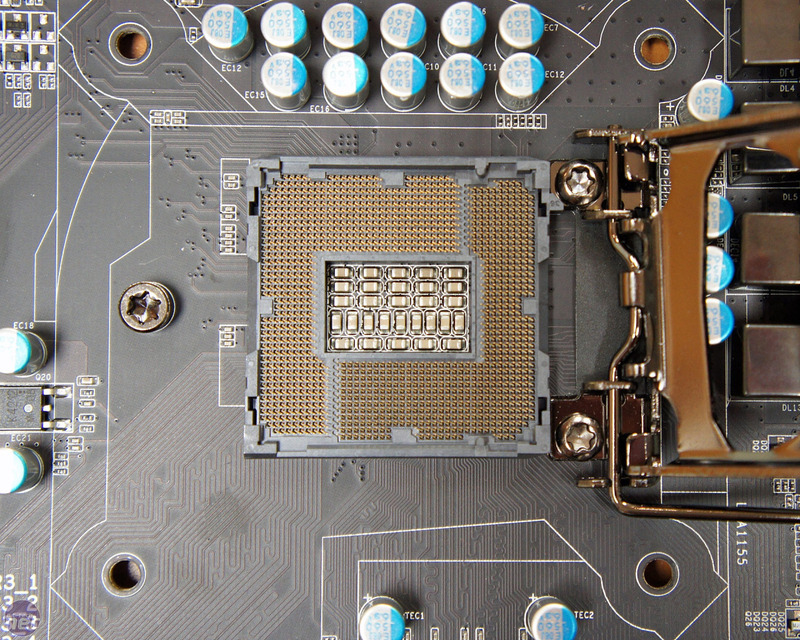 The socket needed by the processor must be matched by the motherboard you choose to use. The motherboard I chose for my build is the Gigabyte GA-P67A-UD3-B3. It uses the Intel P67 north bridge, and has the LGA 1155 socket needed for the processor chosen above. For RAM(Random Access Memory) I will be using a G. Skill Ripjaws X series 2x2gb 240 pin DDR3 PC3 14900 Kit, this matches the speed our motherboard operates at so they are compatible. The hard drive in my machine will be the Seagate Barracuda 7200.11 SATA 3.0GB/s. This is a 1.5TB drive to store plenty files. A second SSD(Solid State Drive) will be included as well. I chose a 60gb OCZ Vertex 2. This drive is ideal for installing Windows or any operating system you choose. The case is all up to preference, but I particularly like the Antec 900 ATX mid tower. For an optical drive, I am purchasing a Lite-on Blu-ray drive. And finally, the GPU(graphics processing unit). In my case, this beast will be used for gaming as well as editing videos, so a powerful graphics card is needed. So I will be using the Galaxy GeForce GTX 560 Ti. The power supply I chose is the Thermaltake TR2 750W. As well as all the parts listed above, I will need a small tube of thermal paste, I always use Artic Silver. And finally, the most important part needed: a screwdriver. Now the actual build itself. First off I will put in the motherboard. In an ATX case, there are 9 holes that will line up with the 9 holes in the motherboard. I match all nine holes up and place a screw provided with the motherboard in each one, and use the screw driver to screw each one in. Now I have gotten the first part done, and next I will be putting in the CPU. The CPU is probably the most important part, and the smallest. In the box there will be two parts, a large contraption with fans and big copper fins. The second part is a small square chip. This is the CPU. This used to be the scariest part of the project when it was 400+ pins where if one got bent, the CPU was shot. In my case, it is an LGA 1155, which means it has 1155 points of contact in a 1.5 square inch area, but they are no longer pins, so it makes things much easier. Installing a CPU is very simple. On the top left corner of the motherboard is a small square piece, this is where the processor fits. There is a small triangle in one corner of the CPU and on the piece on the motherboard, I need to line these two up and drop the CPU into place. Once the CPU is put in, there is a small plastic or metal lever that you pull down and lock into place. Next I use the thermal paste, since we have a quad core; we need to have the paste on each core. I apply the thermal paste in an “X” shape across the processor, only a small amount is needed. Next the heat sink, which is the other part in the box that came with the CPU. It has four pins that line up with 4 holes placed around the processor spot, I line these up and simply push the plastic pieces on top to snap it into place. Here is a picture of where the processor will sit on the motherboard. The next steps are the simplest and they can be performed in any order. I will start with the memory. To the right of the CPU, there are 4 slots, I have two sticks of RAM. Most motherboards have two channels, and each channel is color coded. For example, two slots will be yellow, and two slots will be orange. And they are usually organized in a “Yellow, Orange, Yellow, Orange” order. In my case I will be placing a stick of RAM in the first and third slot. The ram lines up with the slot, snaps in easily, and then I pull down the tab at either end of the RAM, and it is in place. The next part I will be putting in is the Hard drive. This and the optical drive are both the simplest things to do, and both fit in the same way. The hard drive fits in a slot on the front of the case. It is exactly 3.5” wide, and the hard drive slides right in. Once the hard drive is in place, two of the three holes on the side of the hard drive should match up with two holes on the case, put a screw in each one. The Blu-ray drive uses the same steps, except it fits into a 5.25” drive bay at the top of the front of the case instead of the bottom like the hard drive. Finally I will be putting in the GPU. This is as simple as the memory. On the back of the motherboard towards the center, there is a long plastic slot above many other slots that are the same. It is the one(sometimes two in the case of an SLI or Crossfire board) slot that is different than the rest. This is called a PCI-Express x16 slot, the rest are PCI slots, and any small(1”) slots are called PCI-Express 1x slots. The graphics card has two DVI(digital video interface) slots on the back, these point towards the back of the computer. The back of the GPU lined up with the back of the case, I simply snap the metal contact bar that sticks out the side of the graphics card into the PCI-E x16 slot. In this picture, the top slot is a PCI-Express slot which is where your graphics card will fit. The next two are PCI slots which can be used for accessories like a modem or network card. The last slot is a 1x PCI Express slot which is also used for an accessory such as a soundcard. Now that everything is snapped into place, things start to get more complicated then legos. I now need to plug everything into the PSU(power supply unit). First is the motherboard. This is the biggest plug that comes out of the power supply which is located in the top left of the case. The motherboard uses a 24 pin plug arranged into two rows of 12 pieces. Plug this into the motherboard in a slot that lines up with all 24 pins. Next the GPU needs power. The 560GTX uses two plugs as it draws a lot of power. Both are 6 pin molex. I found these in the mess of cables from the PSU, and plugged them into the GPU on the front of the card. The Hard drive uses a SATA power cable. Unlike most plugs, it is a small black plastic bar plug, this plugs into a slot that looks the same on the back of the Hard drive. The optical drive, and any fans that came with the case all use a 4 pin molex plug. There are many of these coming out of the power supply. I simply plug it into the back of the Blu-ray drive, and any fans in the case. Finally the data cables for the optical drive and hard drive need to be plugged in. Both use the same type of data cable. On the front of the motherboard there are 4 SATA ports, they look like shorter forms of the plug used on the Hard drive. I simply take one of the cables supplied with the motherboard and route it from the SATA ports on the motherboard to the SATA port on the back of the hard drive and another cable from the motherboard to the Blu-Ray drive. The final step is to wire the power button on the case and to plug in any fans included with the Antec 900. The fans use a 4 pin power cable and there should be plenty coming out of the power supply. Plug all these in so the fans have power. The power button can be tricky. On the bottom of the motherboard, there will be some small square ports with a few pins. On the case, there are some wires with pins that should be labeled as ground, "+," and "-." A book that came with the motherboard should have a listing of which pins are ground, positive, and negative. Match these with the wires from your case which should have a small piece to fit over the pin on the motherboard. If the case you chose includes USB ports or any other ports, you will have to match wires in a similar fashion by looking in your motherboard manual and matching with the labels on the wires. My computer is now ready to run. It is as easy as legos, especially with my guide. The next steps would be to choose your monitor, mouse, keyboard, and operating system. Once you have done all this, the computer should be ready to fire up. If it's easier on your eyes to read, PM me and I can send the Microsoft Word file. Thanks for your entry, I have formatted some of your paragraphs and also given it a more descriptive name. Ok, cool, thanks. It didn't import really pretty from Microsoft Word. I agree, I might throw some in next week. I have finals this week. This started from an english paper I wrote a few years back. I modified and updated it. Lucky. You get to write english papers on computers. I have to write about symbolism and theme and tone etc. Blah. Nice prose, agree though that it could really do with some pics - they do make these sorts of guides much easier to follow! Thanks, yea, I just got a camera for my birthday, so I'll snap some pictures next week for sure. Gives me a good chance to clean my computer out too, lol. Put a few pictures in. I decided to use google image pictures rather than my own since they are a lot clearer and cleaner, haha.